1 How to prepare a new thermos? 1.1 How to brew green tea in a thermos? 1.2 How to brew black tea in a thermos? 1.3 How to brew a thermos of herbal infusions? Thermos - a necessary thing for chaemana, because there is always a great opportunity to drink hot tea, even at work, even at home, though on a journey. That's just not everyone knows how to use it, to tea does not lose its beneficial properties while using a thermos. We consider all the nuances. How to prepare a new thermos? First of all, note, what thermos only need to buy a glass bulb, metal, we will not work, because it will spoil the drink. 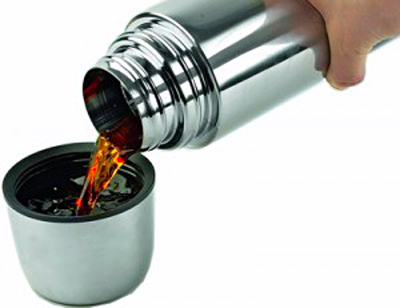 Thermos with lever for water supply is very suitable for brewing tea Strait. If a new thermos, it must wash, and not only to the flask, but all the details (do not use any abrasive substances and detergents, of them will smell, better to use baking soda), and then fill a teaspoon of it is green tea, can be the cheapest, and pour boiling water. Close the lid and leave it on 4-5 hours. Content merge, flask wash, be dried. Now thermos will not give an unpleasant smell of the factory, which spoil the tea. If at one time the smell has not disappeared, then repeat the procedure again. Likewise, it is necessary to do, if a long time do not use thermos. Remember, that wash and dry the thermos, keeping it open, required after each infusion. How to brew green tea in a thermos? For green tea better to use a small thermos - on 0,5 – 1 l. Prepared tea batch filled into scalded with hot water thermos, fill up ostuzhennoy 80aboutWith boiling water and close the lid. Typically, in a thermos for tea can be brewed from half, and to be 5-6 hours, then he starts to taste bitter. To brew tea the most important thing - it is to calculate the proportion of its. After welding, It is in a thermos, intensively gives their properties, zaparivayas. If you shift welding, tea is very astringent, if you do not report, the weak and tasteless. therefore, try pour dry tea leaves little less, than you take in the normal brewing in the teapot, then adjust the amount according to your taste. You can use the desktop weights, each time to get the same amount of tea to brew in a thermos. How to brew black tea in a thermos? Concerning black tea, then in any case should not be long push it directly into a thermos, insofar as, with long-term welding of hardening, start selection therefrom of hazardous substances. And if brewing black tea with a thermos, only briefly, no more 10 minutes, and then be sure to drain the infusion of the tea leaves. But if you want hot tea to take to work or hiking, it is much more useful and easier to brew black tea in the usual way, using a teapot, and then strain it through a strainer into a thermos. In the same way you need to do so, who prefer tea varieties Puer, first completely pre-prepare it according to the recipe, strain the infusion, and you can pour into a thermos. How to brew a thermos of herbal infusions? herbs, eg, melissa, Thyme can simply add in a pinch of tea in a thermos filled. However, elite varieties of tea, where it is important to preserve the aroma and taste, better from such additives refrain. You can brew in a thermos herbs, it is very convenient. The basic rules are simple - a thermos with boiling water to scald (Caution! ), add the required amount of grass (usually a recipe written on the packaging), pour boiling water. The effect of both the infusion on a steam bath, retains all the nutrients. Important: for brewing herbs have a separate thermos, otherwise, then the aroma and taste of tea will be ruined!.